Greetings friends! I’m Colleen O’Brien, a certified personal trainer and registered dietitian. If you’re visiting my website it’s probably because you’re looking to enhance your health and physical well-being through diet and exercise which is something I applaud you for. Eating healthy and staying physically active can be a challenge as we navigate the stresses of daily life. We only get one body and we should treat it with the kindness and respect it deserves. At times, it may be a bit tricky but it can be done and with a plan and some guidance it becomes so much easier! So what is it that I can offer you and why should you work with me over all of the other fitness/nutrition experts out there? I’m extremely passionate about what I do and I care deeply about helping others to achieve their goals in the areas of nutrition and fitness. The wisdom I can offer you comes from a mixture of life lessons and higher education. In high-school I was an all-around athlete. I competed in track and gymnastics, played on the basketball team and was a cheerleader. I started dieting to slim down. All of my crazy dieting led to a unhealthy and negative relationship with food and my body. My saving grace was that I loved moving my body. That’s what led me to become a personal trainer. I love seeing how far I can run or how much I can lift or how hard I can kick and punch. Getting right with my relationship to diet and nutrition was a process along the way. After a time as a trainer I saw some people taking a kickboxing class and thought it might be a fun way to get a workout in. It was love at first kick and that passion led me to training and competing in the martial art of Muay Thai kickboxing. The strict ‘no food’ diet from my past did not cut it when I started training and preparing for competition. I realized that to perform the way I wanted I had to start eating properly to fuel my workouts. I kept gassing out due to lack of proper nutrition. For me to perform at the highest level I needed to learn how to eat for success. I really had no idea what I should be eating to keep my energy up, keep my lean muscle mass and lose body fat to make weight for my competitions. At this point I had been working for approximately 16 years in New York City’s top fitness clubs as a class fitness instructor and had my own private personal training clientele. I decided that the best way to learn about nutrition was to return to college and finish the undergraduate degree that I had started at the University of Wisconsin 15 years before but never finished. 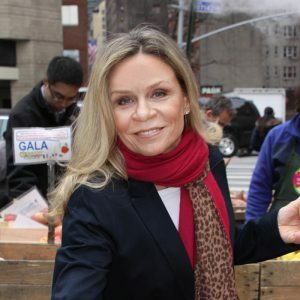 I completed a Bachelor’s of Science degree in Nutrition and Food Science from Hunter College and then attended Teachers College – Columbia University. After completing a Master’s of Science in Nutrition and Public Health at Columbia, I was accepted into the TC-Columbia dietetic internship. When the internship was done I sat for the Registered Dietitian test and passed. I was granted the certification of Registered Dietitian which is the gold standard in the field of nutrition. Scientific evidence-based practices are the most reliable and give the best long-term results. Diets do not work. Research shows diets promote weight loss and then weight gain because most diets are restrictive and not sustainable. When a diet is restrictive it does not provide all of the daily macro and micronutrient recommendations. The best diet is to eat a diet rich in fruits, vegetables, lean proteins, multigrain and low-fat dairy. Think of eating the rainbow – you will get a wide variety of foods that will fulfill your mineral and vitamin needs. The body was made to move. What is your favorite way to move? Is it running, walking, dancing, gardening, swimming, or maybe stretching? I believe you have to find the type of movement you love and use it in your workout routine. Yes, we should all do some weight training, cardiovascular exercise and stretching but there are so many ways to get the job done and enjoy ourselves along the way. Everyone needs a plan. Sounds simple, right? The bottom line is everyone needs a plan to achieve their goals. Get the low down on nutritional label reading. Go from confused to knowledgable with these 5 easy steps. I take your privacy seriously and promise never to share your info. No spam ever.